If you work as a medical sales representative, delivering customer service is probably a big part of your job. Too often though, medical reps fall prey to focusing on customer service activities at the cost of sales. Why not do both? This podcast episode will help you balance your customer service activities while continuing to drive sales for continuous sales growth. Please leave a comment on iTunes or below. Thanks! 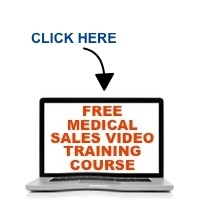 Describe your medical sales situation and I’ll tell you the ONE THING to do next, absolutely FREE.